Everybody knows that we are constantly immersed in a soup of microorganisms, inside us and all around us, but we can't see them, because they are very tiny, microscopic. The fact that we cannot see them do not implies that they do not exist. We have an intrinsic limitation in our senses that blocked us from be aware of them until somebody invented the microscope, after that we were able to know that they are thousands of different types of microorganisms, with multiple and very varied shapes, configurations, some of these shapes change like tiny amoebas. To be able to see some of them, virus for example, electronic microscopes are needed with very powerful magnification. Only after the invention of the microscope we were fully aware of their existence and the overwhelming influence that these very tiny living beings have for our continual survival and in all earth biosphere. The same can be said word by word of anomalies. The sky produce a very strong scattering of visible light, almost a third of the sun light is scattered by the atmosphere. This "simple" phenomenon has tremendous repercussions on the topic at hand. Because of this scattering any small semi-opaque object, let’s say one meter in dimension will be invisible to our eyesight in daylight just at a few thousands of feet in altitude, if the object is smaller or more opaque it will be "invisible" even at lower altitude. So then this "simple" phenomenon causes a very misleading impression to anybody looking up in a clear sky, the many small and not so small objects that populate our sky: bugs, birds, drones, high altitude airplanes and other things, almost all of them are "invisible" to our senses creating in us the false impression that in a blue sky when we do not see anything then nothing is up there. That impression has been with us all the time, since the very first humans were looking at the sky. So we have an intrinsic limitation in our senses that had blocked us from being aware of the many different objects that populate our skies. Now you will start seeing the parallel with the microorganisms case. But now we have a "new" instrument that allow us to bypass that limitation in our senses, like a microscope for microorganisms, and that "new" instrument allows us to "see" almost all the little objects that populate our skies. That new instrument is a "dual optical system". A dual optical system is a combination of two independent optical parts. At his point in time, my experience and knowledge tells me that without the use of a dual optical type system, anybody trying to observe the small objects in our sky will be very limited, it will be like using a loupe to observe microorganisms. Now in the same way that by using microscopes a "new world" of life forms was open to our knowledge and study, by the systematic use of a dual optical system a "new world" is being opened to our observations and you will detect “new” objects that are not the standard ones that almost anybody will expect. These new objects are what some of us call: anomalies or sky anomalies. For example Unidentified Flying Objects forming digits 3 and 5. These objects are "messages" in themselves and you can get a reply back from them, not using multi-million dollars Radio-Telescopes dishes, just simple mirror signals, a "low-tech" way to send signals in daylight that have been used for thousands of years, how ironic life can be!! I always sent prime numbers mirror reflections to the "anomalies", number 3 first and then number 5, the first primer numbers after 2, well this anomaly formed these two numbers: 3 and 5. Coincidence? If these objects have an earthly origin since they appear to be in the high level of the atmosphere then they will be all over the planet because the conditions on those high levels are almost the same in any location, now if these objects are not from earth then since the universe extend in all directions, these objects will be coming from any direction at any time. In the same way that stars are masked by the sky scattering of visible light in daylight any small object in the atmosphere is also masked. This masking effect is lower in the infrared portion of the spectrum and even lower in the short radio wave portion, so scanning the sky in the infrared or in the short radio wave (radar) portion of the spectrum is a lot more effective than scanning the sky in visible light. Some anomalies respond with bright flashes to direct light signals in daylight or at night. Some anomalies had responded by morphing into digit shapes correlated to the signals sent to them. After observing anomalies systematically the idea that they are living beings is a natural one. 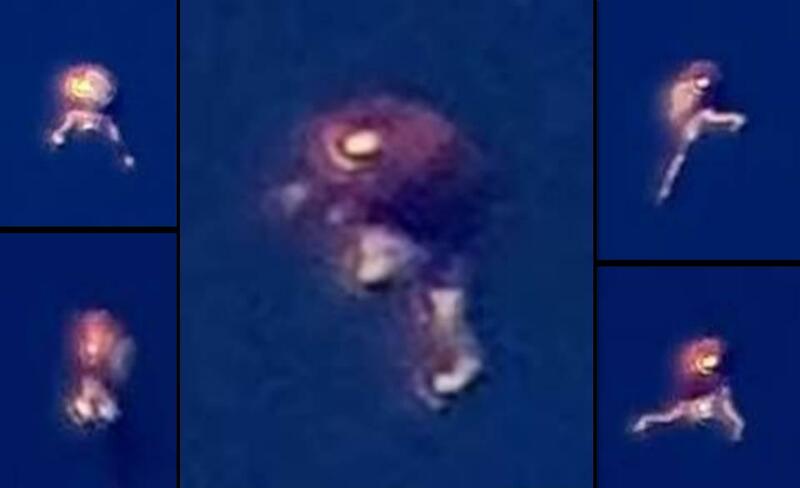 The videos below show some of these amazing and surprising anomalies. 1- A modified LG camera, 1/3"CCD, standard definition, with 16-160mm motorized lens and 950nm pass IR filter, USB video capture card used in a PC with iSpy. Magnification up to 26x. 3- A SDI-HD Panasonic board camera in "prime on a Meade 1000mm short tube scope, no filters connected via coaxial cable an AJA SDI-HD video capture card on the "observing station" PC. Magnification 166x.